Zuko and Katara. . Wallpaper and background images in the Zuko and Katara club tagged: zutara katara zuko waterbendertash. This Zuko and Katara fan art contains anime, banda desenhada, manga, desenhos animados, mangá, and quadrinhos. Ha! Total Zutara! 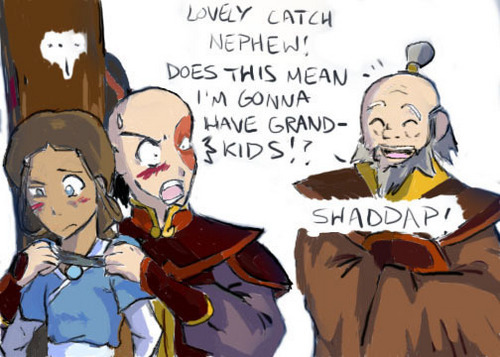 Wait not to ruin the pic but isn't he supposed to have grand niece or nephew? Yea I was thinking the same thing too Domodomo but mabel the person who drew this didn't have enough room. wow, that coulda happened - so funny!